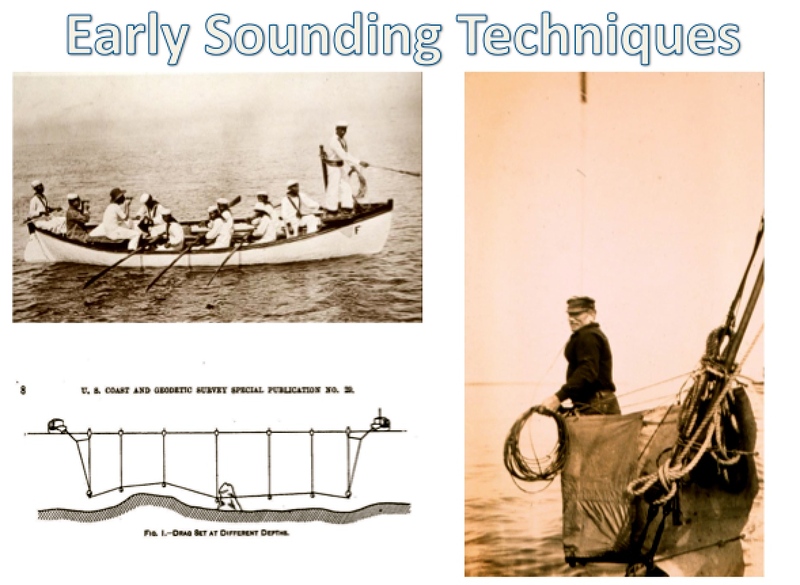 It is amazing that with hydrography, scientists can “look” into the ocean to “see” the sea floor by using sound. 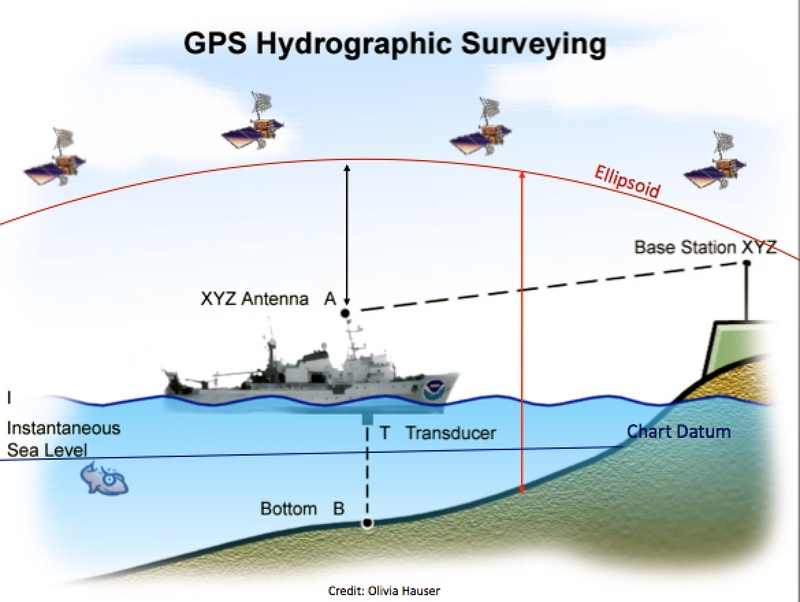 All the data collected by the TJ, and other NOAA Hydro ships, is used to update nautical charts and develop hydrographic models. This is important work because the charts are used to warn mariners of dangers to navigation, which can mean everything from rocks to ship wrecks. 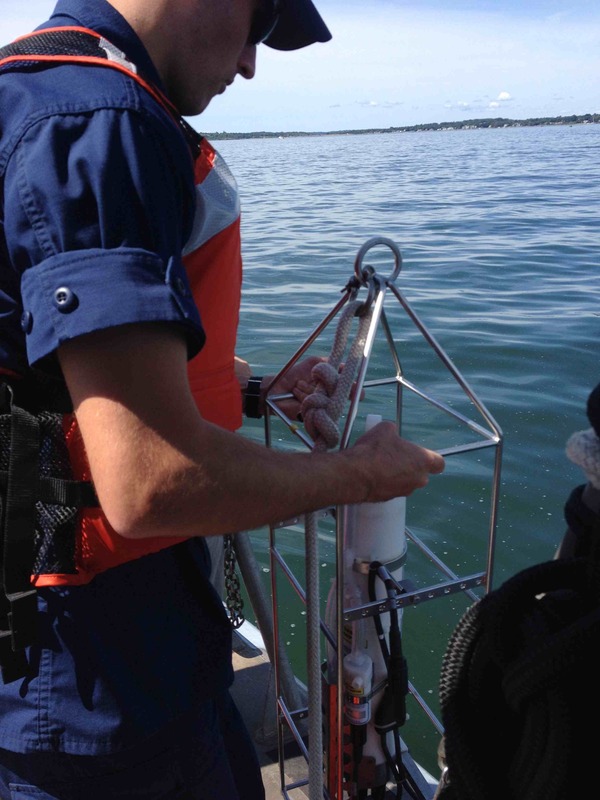 They also record tide or water level measurements to provide information about water depths. Surveys also help determine if the sea floor is made up of sand, mud or rock, which is important for the anchoring of boats, dredging, construction, and laying pipeline or cables. Hydrography also provides important information for fishery habitats. 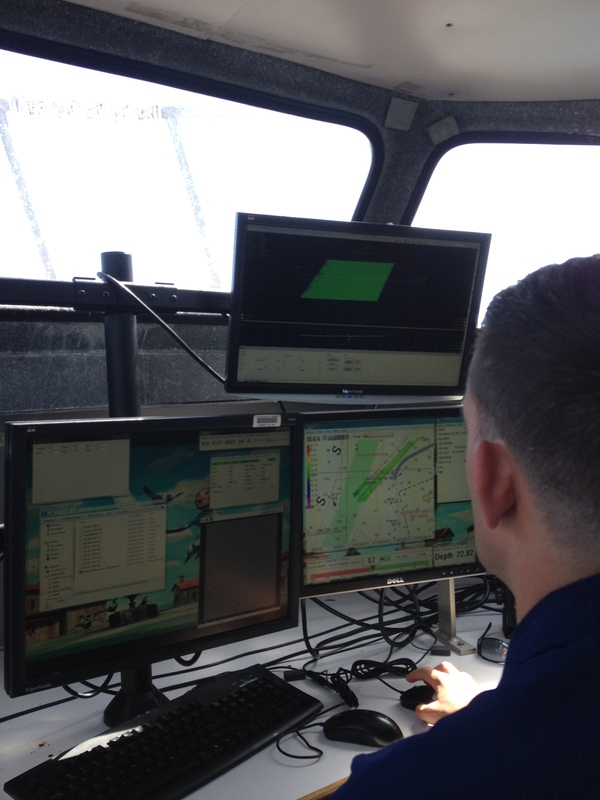 The work being done on the Thomas Jefferson is a great example of STEM in action since hydrographic surveying combines science, lots of technology, the engineering of new devices and procedures, and the application of mathematical computations. A few of my students emailed me yesterday to ask how does the information gathered out on the launch become a chart. That’s a great question! 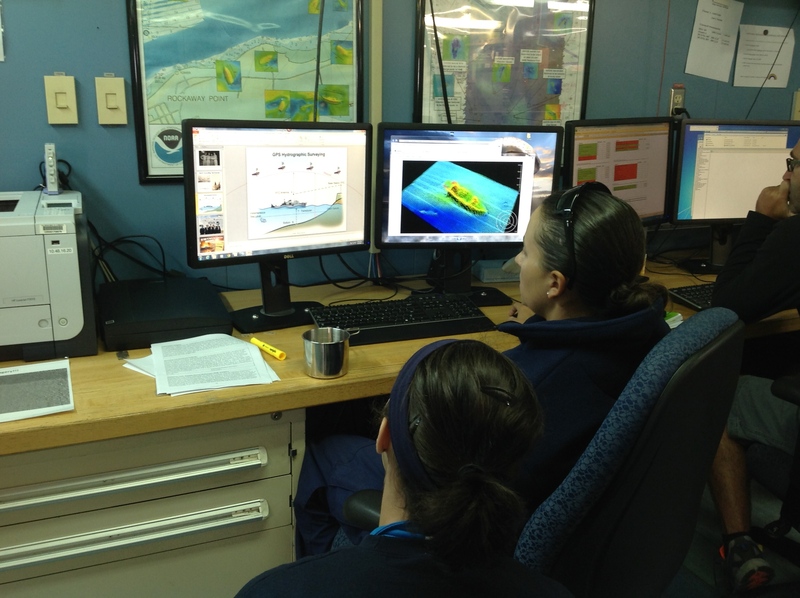 The operations branch of the Hydrographic Surveys Division of the Office of Coast Survey in NOAA (where Patrick works-see below) uses this document to decide where the ship will survey next. This branch then provides the ship with project instructions that identifies where the work will be done and divides the survey area into manageable chunks. The data is raw when we first acquire it, and once it comes back to the ship, we need to apply some correctors to it, to improve the data quality. One corrector we apply to the data is tide information. The water gets shallower and deeper depending on the stage of tide, and we need to make sure the depths on the chart are all relative to the same stage of tide. Another corrector we apply to the data is vessel motion. When we acquire depth data with the sonar, the boat is moving with the waves, and the raw data looks like it has waves in the seafloor, too. 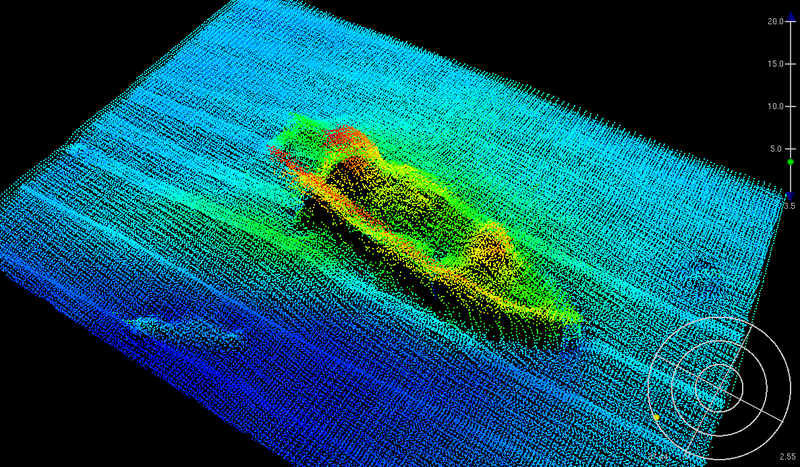 We know that is not the case, so we take the motion data of the boat out of our depth data. A third corrector we apply to the data is sound speed. The sonar finds the depth of the seafloor by sending a pulse of sound out and listening for its return, measuring the time it takes to complete that trip. We also measure the speed of sound through the water so we can calculate the depth (see the picture of ENS Gleichauf deploying the CTD to measure sound speed). Speed =Distance/Time. Speed of sound through typical seawater is 1500 meters per second. The speed of sound changes with water temperature and salinity (the saltiness of the water) .If we measure the time it takes for the sound to get to the seafloor and back, 1 second for example, and the sound speed is 1500 meters per second we know the seafloor is 750 meters away from the sonar. (the sound is traveling two ways). Once all of the correctors are applied to the data, a digital terrain model (DTM) is created from the data to make a grid showing the depths and hazards in the area. A report is written about the survey, and it is submitted to the Atlantic Hydrographic Branch (Where Jeffrey works- See below). This branch reviews the data and makes sure it meets NOAA’s specifications for data quality. They also make a preliminary chart, picking the important depths and hazards that should be shown on the chart. Once the data has been reviewed, it goes to the Marine Charting Division. This group takes the preliminary chart of the area surveyed, and adds it to the official chart that is being updated. These charts are then distributed to the public. I had a chance to talk with some of the Survey Techs and project scientists who work on the TJ to find out more about their jobs. Allison Stone is the Hydro Senior Survey Technician (HSST). When Allison was 12 years old she clearly remembers her school’s Career Day, when lots of parents came in to talk about their jobs. She recalls there was one mom who had a sparkle in her eye when she talked about her job. She was an Oceanographer. That mom became her advisor when she attended the College of Charleston. Allison had an internship at the Atlantic Hydrography Branch in Norfolk and she first came to the TJ as a Student Scientist. She later became a full time technician. She enjoys her job because she gets the opportunity to observe the seafloor like no one has ever seen it before. She gets to solve problems and think outside the box. When she is going through raw data, she is able to make connections and interpret information. The work is interesting and challenging. Allison’s advice for young students is to keep being passionate about things you are interested in. Try to find out more and stay flexible. Try to volunteer as much as possible as you grow up so you can find out what you like to do and love to work on. Jeffery Marshall was visiting the TJ for a project during my time aboard. 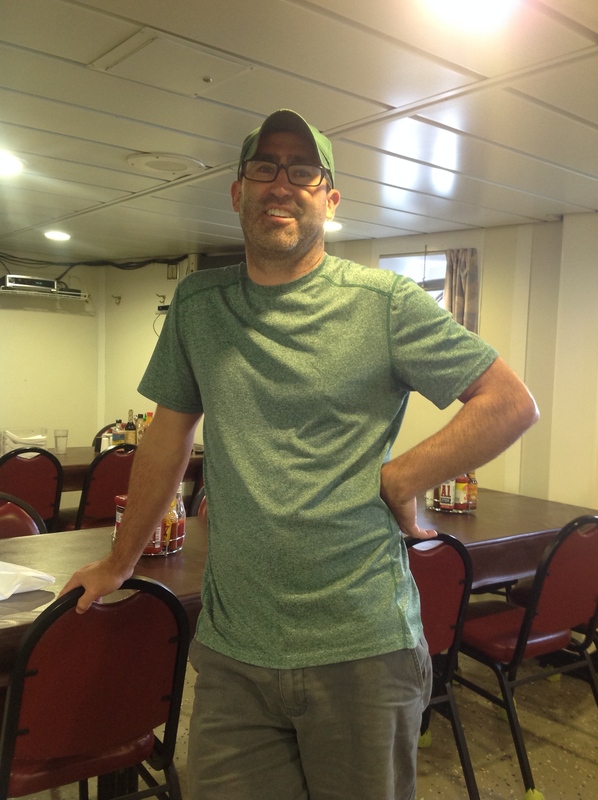 Jeffery is a Physical Scientist with the Office of Coast Survey as a member of the Hydrographic Surveys Division, Atlantic Hydrographic Branch in Norfolk, Virginia. 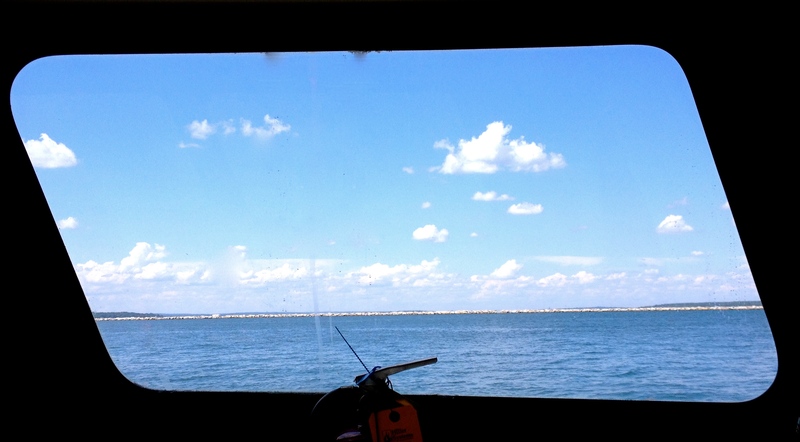 Jeffery grew up on the Jersey Shore and loved being out on the water, down at the beach and learning about the ocean. He loved surfing and was always wondering what the weather would be like so he could plan for the waves and the tides. So when he went to college, he studied meteorology. Following graduation, he taught middle school science and loved being a teacher. When he was ready for a change, he decided to attend graduate school and got his masters degree in Coastal Geology. He really enjoys having the opportunity to get out on the ships. 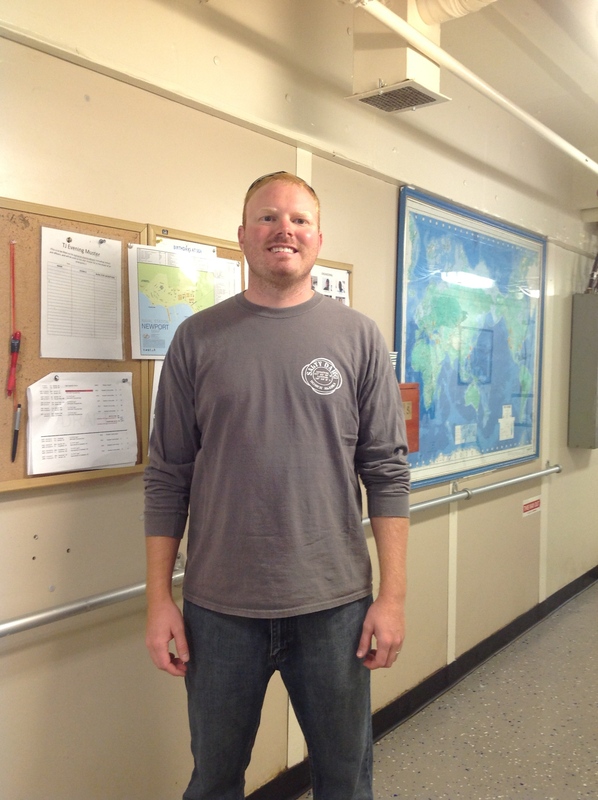 His job is usually applying the processed data to charts, what he calls “Armchair Hydrography.” When he gets a chance to work on a NOAA ship mission, he has more opportunities to collect and analyze data. Jeff’s advice to young students is to read a lot and think about lots of different things, like how we use maps. He thinks everyone should take a look at old maps and charts, and think about how they were made. He encourages students to look for patterns in nature and to think about how rocks and sand change over time. 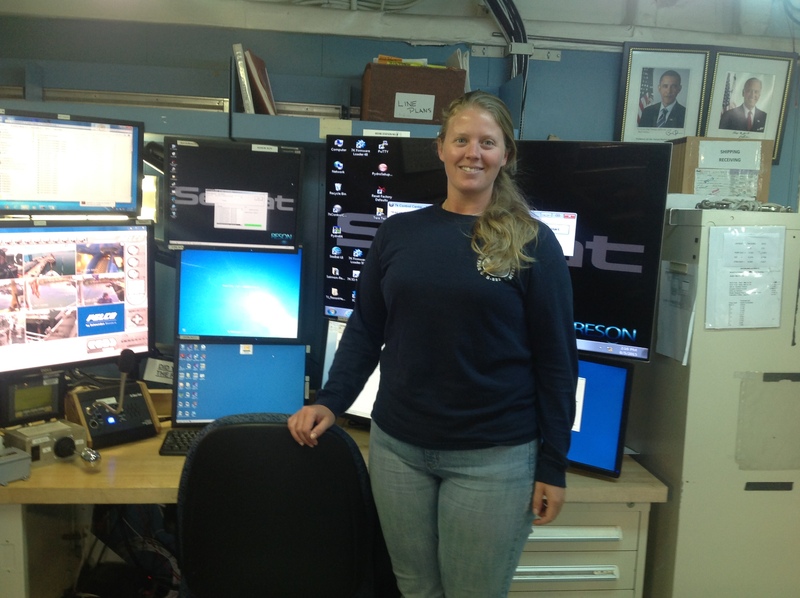 Cassie Bongiovanni is a GIS Specialist who works at The Center for Coastal and Ocean Mapping/Joint Hydrographic Center. The center is a partnership between the University of New Hampshire and NOAA, and it has two main objectives: to develop tools to advance ocean mapping and hydrography, and to train the next generation of hydrographers and ocean mappers. Cassie grew up in Texas and did not like science at all when she was young. She attended the University of Washington in Seattle and fell in love with the ocean. She received her Bachelors of Science in Geology with a focus in Oceanography. 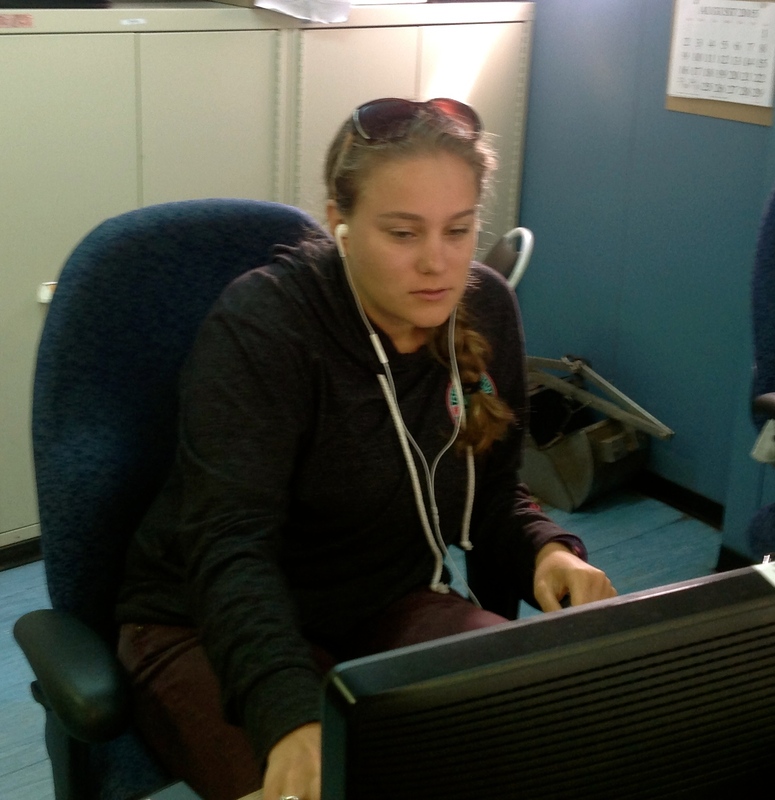 She is now working with NOAA’s Integrated Ocean and Coastal Mapping group on processing lidar and acoustic data for post Hurricane Sandy research efforts. Cassie explained that she loves her work because she loves to learn! She has lots of opportunities to ask questions and discover new things. The kid in her loves making maps and then coloring them with bright colors to create 3-D images of things like shipwrecks. 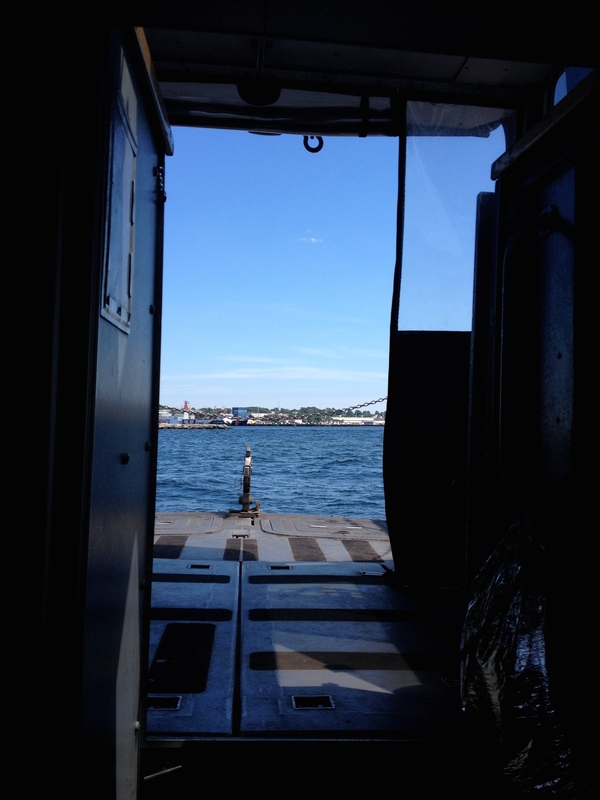 The launch headed out again today to try to find a ship that sank earlier in the summer. 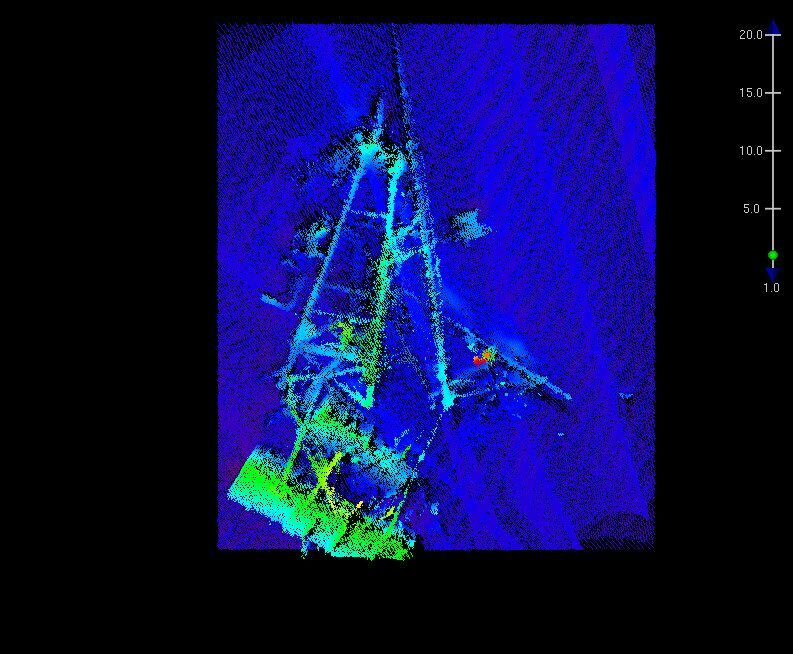 Information was gathered and lines were surveyed, but so far no shipwreck was found. 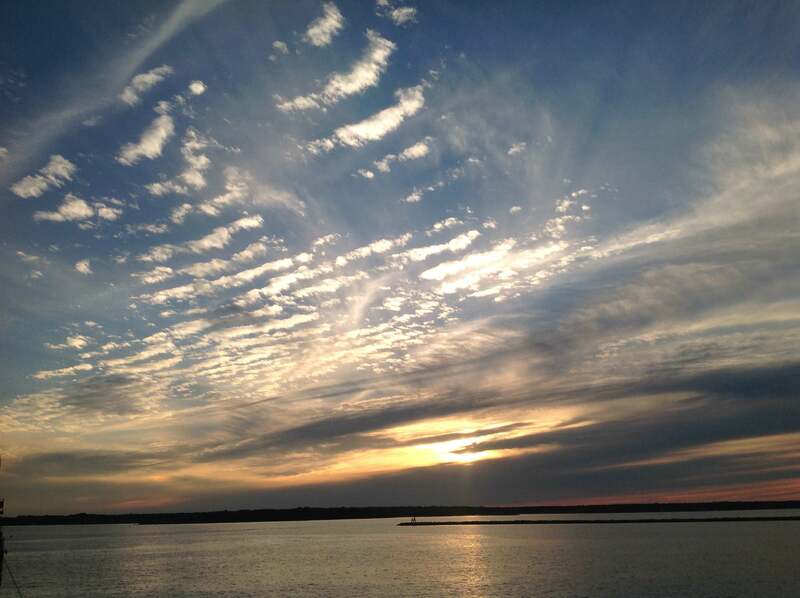 The day ended with a beautiful sunset. How was the ocean floor mapped before sonar was invented? Mariners have used many different methods to map the ocean floor to try to “see” what was under the water. For thousands of years a stick was used to see how deep the water was. Eventually, the stick was marked with measurements. Once ships started exploring the oceans, sticks were no longer good options for finding out the depth of water or if anything was under the water that could harm the ship. Sailors started tying a rope around a heavy rock and throwing it over board. In the 1400’s, mariners began using lead lines, which were marked lengths of rope attached to a lead weight. The lead line was good for measuring depth and providing information about the sea floor. The standard lead line was 20 fathoms long–120 feet–and the lead weighed 7 pounds. In the early 20th century, the wire drag was invented. This meant two ships had a set system of wires hung between them and it enabled mariners to find hidden rocks, shipwrecks or other hazards hidden in the water. In my last entry, The Picture of the Day showed Ensign Gleichauf lowering an instrument into the water. 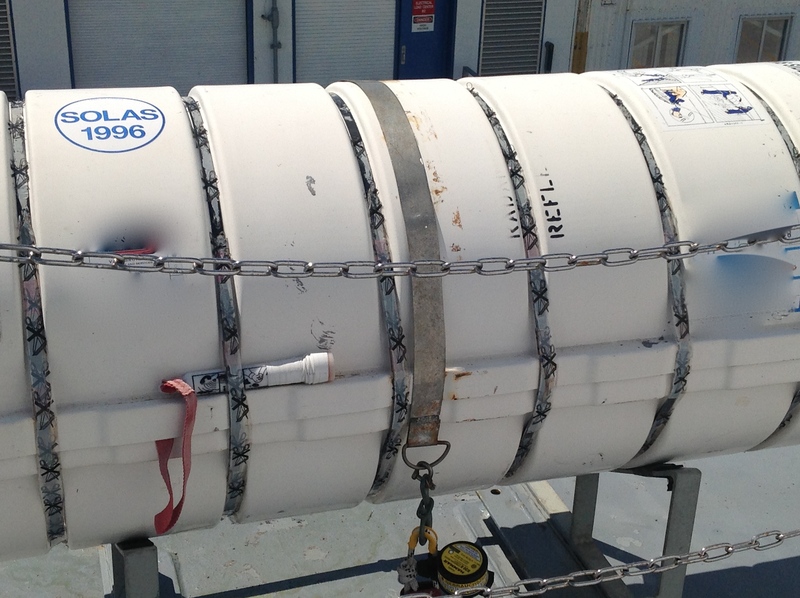 That is a CTD, which stands for conductivity, temperature, and depth. A CTD is made up of electronic instruments that measure these properties. The CTD detects how the conductivity and temperature of the water column changes as it goes deeper into the water. Conductivity is a measure of how well a solution conducts electricity. Conductivity is directly related to salinity, which is how salty the seawater is. Today’s Question of the Day and Picture of the Day: What is this and what do the letters mean? 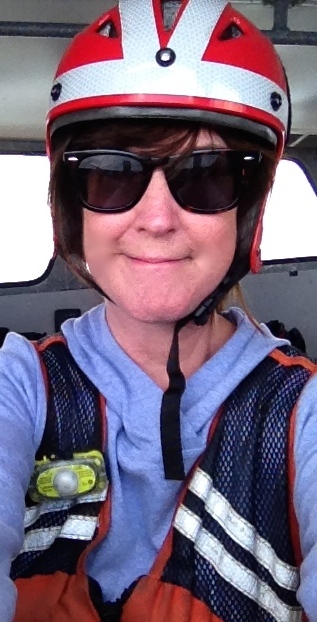 This entry was posted in 2015, Jeanne Muzi, NOAA Ocean Service, NOAA Teacher at Sea and tagged Hydrographic survey, Jeanne Muzi, LTPS, multibeam sonar, National Oceanic and Atmospheric Administration, New Jersey, NOAA, NOAA Ship Thomas Jefferson, NOAA Teacher at Sea, seafloor mapping. Bookmark the permalink.